Girl Scout Emily is a rising junior at Centennial High School who is currently working on her Girl Scout Gold Award! For her project, Emily elected to draw attention to the importance of knowing local history by hosting an event that will take participants to five sites in Historic Ellicott City. Read below to find out more about Emily, why she chose this project, and how you can participate! I’ve always been a history “nerd”. In my younger years, while other girls played with dolls, I read historical fiction and collected Colonial and Victorian costumes. One of my favorite memories was attending a Victorian Dreams Camp at the Patapsco Female Institute in historic Ellicott City where, for one week, I was able to step into another time, dress in a pinafore, sip tea, eat scones, stain my fingers with ink attempting to write in calligraphy, and learn the art of spinning and weaving. It was truly fascinating to learn the history behind the Institute. Even cooler still was the fact that the ruins of a once revolutionary school for girls were mere minutes from my home! About a year ago, I met up with Mrs. Jacque Galke, the Heritage program and Facilities Manager, and none other than my counselor from Victorian Dreams Camp! She informed me that there was no longer enough interest to hold the camp. Apparently kids these days aren’t quite as interested in dressing up and learning the art of fan language (did you know that if your fan was open wide it meant you were in love?). I was saddened to learn about the lack of interest in local history but it inspired me to make Historic Ellicott City the topic of my Girl Scout Gold Award. During the past year, I have been working diligently to plan an event called “Your Past… It Matters!” which will occur on October 5th, 2013 and involve five historic sites; the Patapsco Female Institute, the Thomas Isaac Log Cabin, the Firehouse Museum, the Colored School, Restored, and the B & O Railroad Museum. My event will include a walking tour where participants will receive a passport with information and illustrations which will guide them as they journey through five historic sites. At each site they will be able to take a tour with a knowledgeable guide, and participate in the exciting activities I have planned! Some of these activities include learning spinning and lace-making (from the experts, of course), tracing the history of a local family with roots at the Colored School, Restored, going on a scavenger hunt of Historic Ellicott City’s Relic Wall, playing Graces (a colonial game), trying on pinafores, and more! 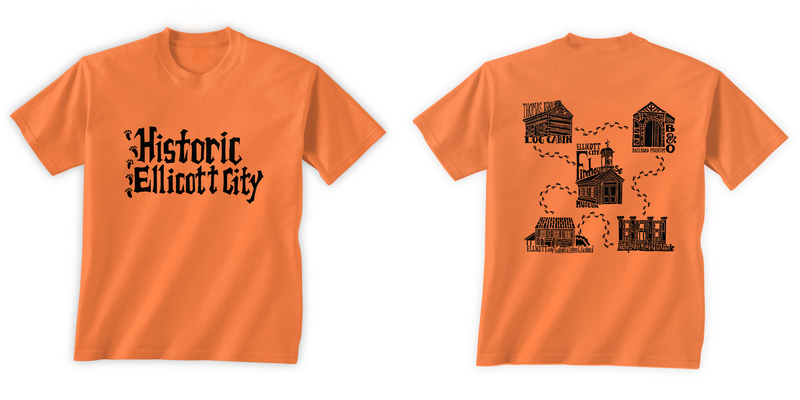 Also, the first 100 participants to sign up will take home a free T shirt designed by a very talented artist promoting Historic Ellicott City and the five sites! Below is an image of the T shirt which is made from good quality, heavy weight cotton, and is quite stylish. My event is on October 5th from 1 – 4 PM, and it begins at the Heritage Orientation Center: 8334 Main Street, Ellicott City, MD 21043. I am pleased to say that sign up is now available here. Registration is necessary due to the limited space in some of the historic facilities and the fact that participants will be given an arm band which gives them entry to the B&O Railroad Museum for free! The event can also be found on page 21 of the Howard County Recreation and Parks 2013 Fall Activity Guide. There is a $10 per person fee that will help to cover the cost of registration as well as bring in the knowledgeable tour guides and provide two shuttle buses for the two less accessible locations. Woah! Great work Emily! Sometimes it takes an awesome event like this one to remind us just how exciting history really is! Are you or someone you know a Girl Scout working on a Gold Award Project? Share it with us! Send a description of your project, a photo of you, and any images you would like to share. Information can be sent to Maura Kovalcik, GSCM’s Web and Social Media Specialist at mkovalcik@gscm.org. Girl Scouts are honest and responsible!